I'm archiving here a set of articles that seem to me worth preserving. Some are earlier versions of ideas that got developed more in books or other essays; others are items that are somewhat hard to find in libraries and aren't available online. Most of my other essays that I'd say are worth keeping will appear in the collection Poetics of Cinema (Routledge, 2007). Review of Noël Burch's "To the Distant Observer"
Wide Angle vol. 3, no. 4 (1980): 70–73. full size Burch's Theory of Film Practice was a major influence on my thinking in the 1970s and early 1980s, and so I was happy to write this review of his major book on Japanese cinema. Although I take him to task occasionally in my book on Ozu, Burch's work remains provocative and illuminating. I devoted a chapter in On the History of Film Style to his early research program (which he has evidently now repudiated). To the Distant Observer is now available online. The Velvet Light Trap no. 19 (1982): 2–7. full size This might have gone into The Classical Hollywood Cinema, but it seemed better to let it sit as a separate essay. The Velvet Light Trap no. 20 (Summer 1983): 34–40. Written in collaboration with Kristin Thompson. 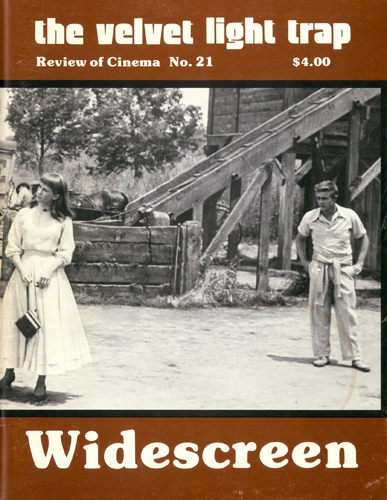 full size One of the more substantial interviews Kristin and I conducted for The Classical Hollywood Cinema. Hornbeck, a wonderful man, died in 1983, not long after our interview. Wide Angle vol. 6, no. 1 (1984): 4–11. full size Another bit of thinking that came from research on the 1985 Hollywood book. Lightweight, but since so little has been written on jump cuts I thought it worth preserving. The Velvet Light Trap no. 21 (Summer 1985):118–25. full size Another chip from the Classical Hollywood Cinema workbench. Some of the examples found their way into the book, but my characterization of Cahiers and Movie criticism still seems to me accurate. Toward a Scientific Film History? full size Barry Salt's two editions of Film Style and Technology: History and Analysis are at once fine and frustrating, for reasons that Kristin and I try to show. This is another piece with cobwebs on it, but it seems to me worth preserving as indicating some of the debates of the 1980s, when understanding the history of film style seemed to matter more than it does now. 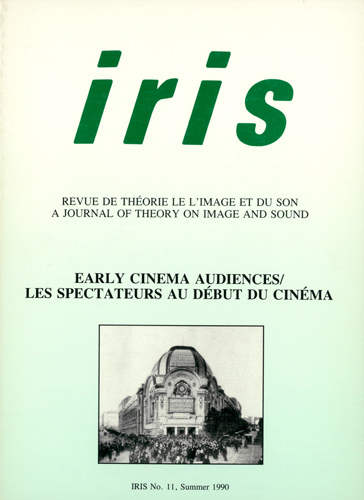 Cinema Journal 27,3 (Spring 1988): 5–20. full size In the 1970s and 1980s, many media scholars were attracted to Vladimir Propp's analysis of the Russian folktale. 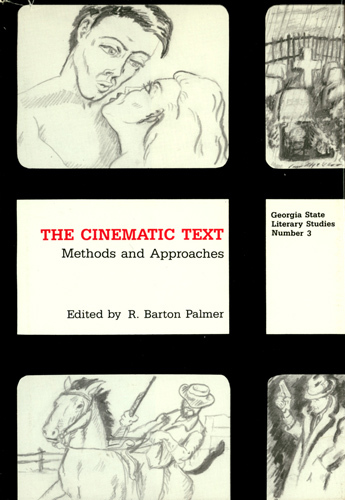 Some thought of it as a methodological model: the idea was to analyze films using his "morphological" approach. Others went further, not only adopting Propp's method but also seeking to show that some films, chiefly Hollywood ones, actually were structurally akin to folktales. 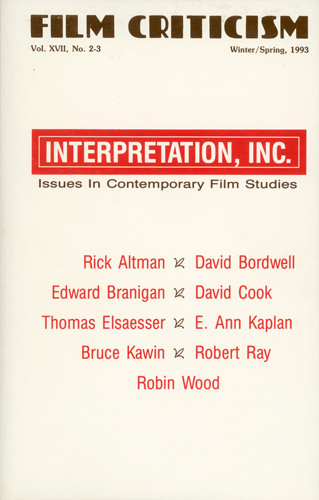 I was fairly skeptical of both the methodological and the substantive lines of inquiry, and as Proppian analyses popped up throughout the 1980s, I went back to his work and tried to show that it wasn't a very fertile approach for film studies. I didn't want to rain on anybody's parade, but I believed that we should subject all our intellectual enterprises to a dose of skepticism. That's what this essay tries to do. Still, I believe that trying out the Proppian perspective wasn't wholly fruitless. It opened up some interesting questions of method (How easily can we transpose work in other disciplines into cinema studies?) and of the domain of inquiry--narrative itself. Bold conjectures followed by attempts at refutation are a crucial part of our scholarly conversation. I suppose that makes me less Proppian than Popperian. From The Cinematic Text: Methods and Approaches, ed. R. Barton Palmer, Georgia State Literary Studies, no. 3 (1989): 369–398. full size This is as close to a summary statement of my overall research perspective as I could come in the 1980s. 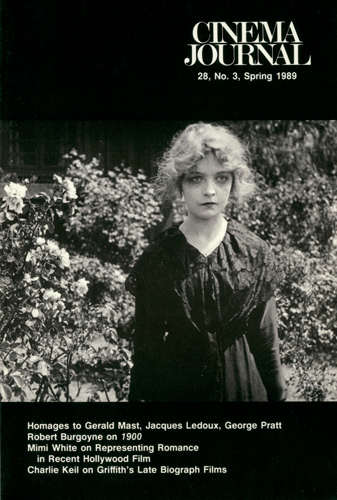 This essay is revised, almost out of recognition, for Poetics of Cinema (Routledge, 2007). 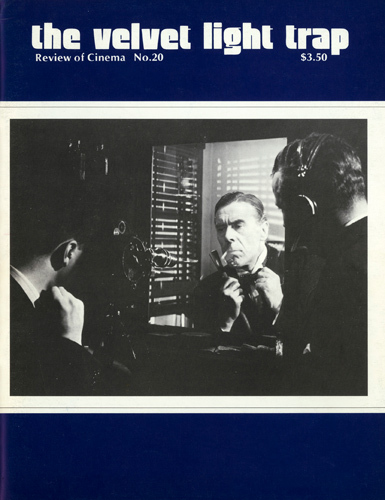 Cinema Journal 28, 3 (Spring 1989): 4–7. Written in collaboration with Kristin Thompson. full size Ledoux was the curator of the Royal Cinémathèque of Belgium and a legendary figure among archivists. He befriended Kristin, then me, in the early 1980s. A great deal of our research wouldn't have been possible without his cooperation. This is our tribute to him upon his death. After his death, I was allowed to name my UW professorship in his honor. Iris no. 9 (Spring 1989): 11–40. full size This was my attempt to survey the literature on the cognitive sciences for film people. Absurd as it sounds, I thought I could pick my way through the major works and show how this research tradition could help us with some perennial questions of film studies. 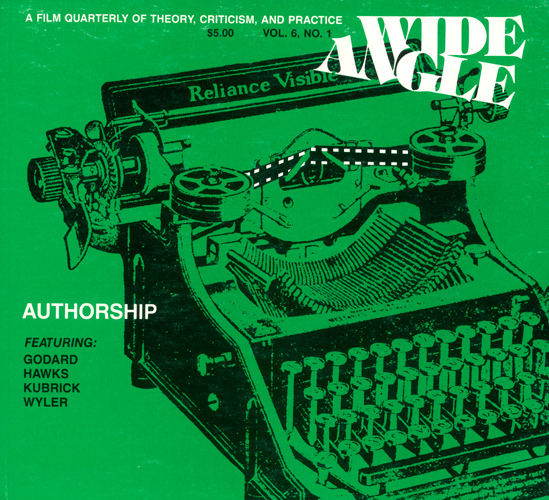 The essay was somewhat influential in its time, helping consolidate the cognitive approach to film studies, but today it's predominantly a historical piece. I think it's important to note, though, that no one in film studies tried to publish this sort of horizon-setting tour of psychoanalysis  then the predominant psychological approach to film in the humanities. We were left to wrestle with Lacan et cie on our own, and usually people who "applied" Lacan didn't read beyond a handful of essays. Maybe it's because I spent a summer reading Lacan, including some of the seminars in both French and English, and I felt I benefited from it. For one thing, I learned that he was a far more eclectic thinker than he was painted by his film studies acolytes. Anyhow, I thought that if I gave a guided tour, maybe the critics of cognitivist film studies would turn to Bruner, Johnson-Laird, Fodor, Chomsky, Gardner, and so on to enrich their understanding of the cognitive sciences. (For one thing, these writers are a lot easier to understand than Lacan.) Hence the bibliographical overkill of this essay. But I don't think that many critics of the cognitive approach considered any of the relevant backstory  a neglect that seems to persist to this day. Usually the skeptics retreat to a priori condemnations of scientific inquiry or "empiricism" or the idea that "we are not computers." It's easier to shoot from the hip than read the foundational work. Iris no. 11 (Summer 1990): 107–112. full size Scholars often resist the cognitive approach to art because they're reluctant to mount causal or functional explanations. Instead of asking how films work or how spectators understand films, many scholars prefer to offer interpretive commentary on films. Even what's called film theory is largely a mixture of received doctrines, highly selective evidence, and more or less free association. Which is to say that many humanists treat doing film theory as a sort of abstract version of doing film criticism. They don't embrace the practices of rational inquiry, which includes assessing a wide body of evidence, seeking out counterexamples, and showing how a line of argument is more adequate than its rivals. I think that the "Case for Cognitivism" essay roused just these sorts of responses in Dudley Andrew's introduction and in Marcia Butsel's essay. This "Further Reflections" essay is my reply to them. I did not convince Andrew, and his "Reply to David Bordwell" (pp. 113-116, not reproduced here) didn't convince me. 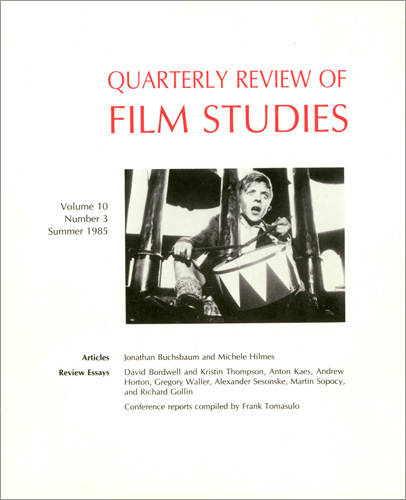 For more on what I take to be the problems of current film theory, see my essay "Contemporary Film Studies and the Vicissitudes of Grand Theory," in Post-Theory: Reconstructing Film Studies, ed. by Noël Carroll and myself (Madison: University of Wisconsin Press, 1996), 3-36. Film Criticism vol. 27 no. 3 (Winter-Spring 1993): 93–119. full size It was a good idea, at first. Lloyd Michaels, editor of Film Criticism, would solicit responses to my book Making Meaning from several film scholars. Then the journal would give me space to reply. This sort of peer commentary and response is common in mature fields but very rare in film studies, so I took Michaels up on it. It would be rather like playing chess with several top players all at once. I would learn a lot. Unfortunately, one respondent, E. Ann Kaplan, didn't submit her piece on time. So in order to meet Michaels' deadline, I had to write my rejoinder to other contributors while she was still preparing her critique. When Michaels saw her essay just before publication, he assured me that the piece didn't require a reply. But what I discovered when the issue was published was far from anodyne. It was a vigorous critique, but I had no opportunity to respond. So much for raising the standards of debate in film studies. So why reprint the essay? I think that it offers a fair summary of the argument set out in Making Meaning, delivered with more oomph than the book does. Seeing the sort of responses MM triggered, I was able to make some things clearer than I had in the original. The essay also replies to misgivings about the book voiced by V. F. Perkins, and probably shared by many other people. So the piece should probably be read less as an exchange in a series of dialogues than as an attempt to explore some issues and to answer some exacting criticisms from a critic whose work I have long admired. La Nouvelle Mission de Feuillade; or, What Was Mise-en-Scène? The Velvet Light Trap no. 37 (Spring 1996): 10–29. full size Expanded into Chapter Two of Figures Traced in Light, this wouldn't be worth archiving but for the first criticism I launched of what I came to call the "modernity thesis." 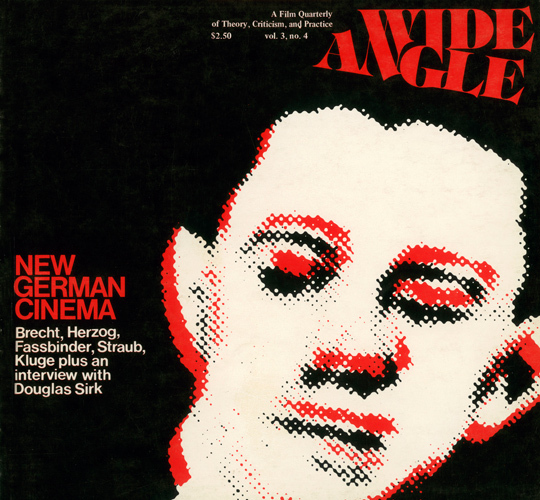 The essay sketchily traces the sources of this idea in German art historical writing and suggests that as it's been developed in film studies, it's too blunt an instrument to explain the emergence of staging practices in Feuillade and his contemporaries. I extend this criticism quite a bit further in Figures, Chapter Six. 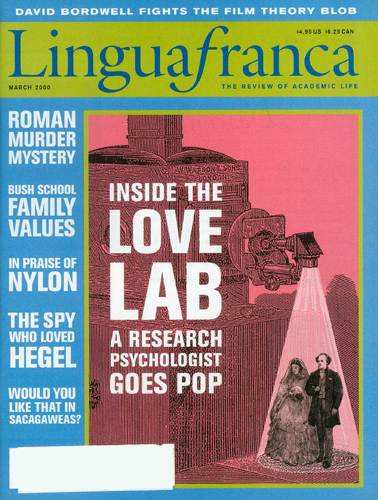 full size Lingua Franca, now defunct, was a magazine devoted to academic trends and controversies, especially in the humanities and social sciences. 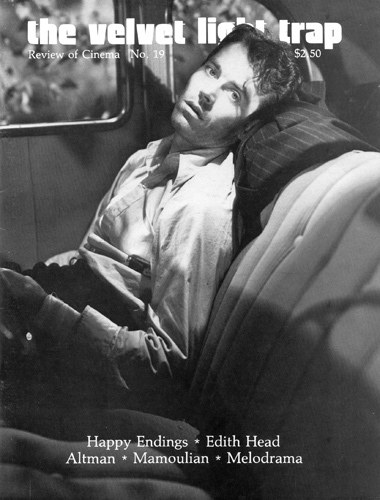 It was fairly hip and irreverent; I suppose today we'd call it snarky. I resisted being profiled because the questions asked by the interviewer were so naïve that I worried about deep misunderstandings. Actually, I think I dodged the bullet, but the schematic quality of the article should be as evident today as it was then. I reprint this largely as a historical curiosity. It's also a little lesson in academic maneuvering. One of the drawbacks of being profiled is that you don't get a continuous passage of prose to state your case. In a letter to Lingua Franca, reprinted at the end of the pdf file, Miriam Hansen got more space to state her objections than I had had to state my case. So I do it here, not just in a polemical spirit but because the points worth considering are with us still. 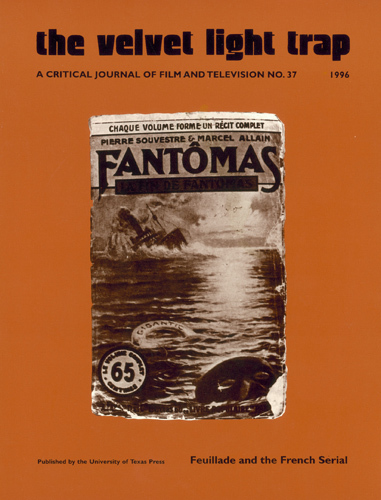 Hansen's main quarrel seemed to be with the article's author, who had failed to mention the University of Chicago film program. In my view, Hansen's criticism mistakenly presupposes that simply creating an interdepartmental program assures an interdisciplinary outlook. 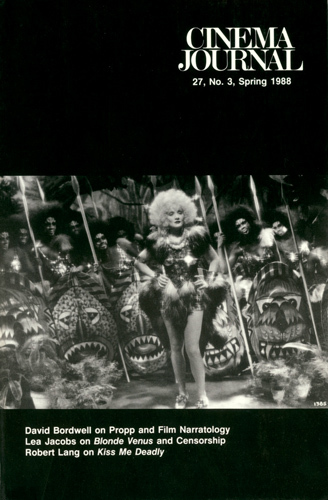 In principle, it seems evident that a freestanding film program could be very interdisciplinary in its outlook; that would depend on the faculty's interests. Similarly, a cross-departmental program could be quite monolithic in its approach, since various humanities departments often house people of remarkably consonant theoretical outlooks. Today, people pursue cultural studies in a wide variety of departments, and gathering these people into a single cross-departmental program wouldn't automatically breed a diverse array of perspectives. Nor is our film area a "freestanding" one. Communication Arts at Wisconsin includes people studying rhetoric, communication theory, and mass media. Our Film Studies area has been enriched by our contact with those wings of our department. In addition, we have many colleagues teaching film courses in other departments. So in effect Wisconsin has long had both a dedicated sector of one department and the sort of cross-departmental affiliations that Hansen prizes. Insofar as Hansen's letter was directed toward my efforts, she charged me and my colleagues with wanting to study film without reference to other disciplines. This struck me as a strange criticism. For one thing, she well knew that my colleagues of that period freely relied on work in art history (Don Crafton, Kristin Thompson) and theatre history (Lea Jacobs and Ben Brewster). As for my own research, any reader of my work knows that I draw upon theories and practices of literature, the visual arts, and music in trying to understand questions of cinema. 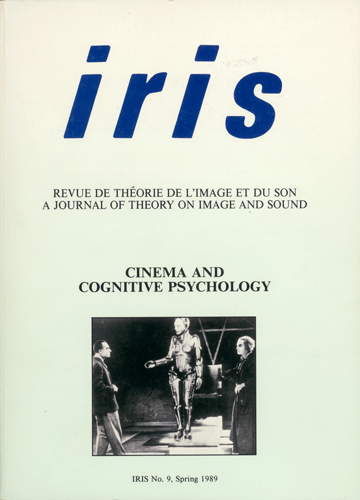 Furthermore, a central point of the Lingua Franca article was to show that I was bringing ideas from other disciplines, notably cognitive science, into film studies. I had to conclude that Hansen somehow didn't consider a cognitive approach to film to be an interdisciplinary enterprise. As I say, strange. But I've encountered this view often since. Scholars praising "interdisciplinarity" tend to rule certain disciplines, and trends in those disciplines, out of bounds from the get-go. So French psychoanalysis, anthropology of a hermeneutic cast, Continental philosophy, and Benjaminian reflections on modernity are said to mate nicely with film studies. But cognitive anthropology, or evolutionary psychology, or Anglo-American philosophy, or Russian Formalist literary theory are somehow ill-suited to the agenda. I've encountered programs in Visual Culture that pointedly ignore empirical facts about vision and salient theories of culture. Why these artificial barriers? Are people just afraid to learn new things? In any event, little real progress will be made in film studies until we sign on for a true interdisciplinarity and let rival explanations, whatever their disciplinary provenance, contend on grounds of logic and evidence. Perhaps this sort of view is what makes me seem old-fashioned.